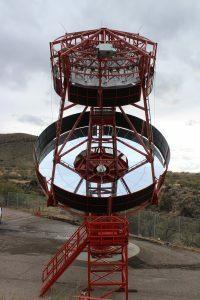 AMADO, Ariz. — On 17 January 2019, a prototype telescope proposed for the Cherenkov Telescope Array (CTA), the prototype Schwarzschild-Couder Telescope (pSCT) is being unveiled in a special inauguration event at the Center for Astrophysics | Harvard & Smithsonian, Fred Lawrence Whipple Observatory (FLWO) in Amado, Arizona. A dual-mirrored Medium-Sized Telescope, the SCT is proposed to cover the middle of CTA’s energy range (80 GeV – 50 TeV). The SCT optical design was first conceptualized by U.S. members of CTA in 2006, and the construction of the pSCT was funded in 2012. Preparation of the pSCT site at the base of Mt. Hopkins in Amado, AZ, began in late 2014, and the steel structure was assembled on site in 2016. The installation of pSCT’s 9.7-m primary mirror surface —consisting of 48 aspheric mirror panels—occurred in early 2018 and was followed by the camera installation in June 2018 and the 5.4-m secondary mirror surface installation—consisting of 24 aspheric mirror panels—in August 2018. Leading up to the inauguration and in preparation for first light, scientists opened the telescope’s optical surfaces in January 2019. The SCT is based on a 114 year-old dual-mirror optical system first proposed by Karl Schwarzschild in 1905, but only recently became possible to construct due to the critical research and development progress made at both the Brera Astronomical Observatory and Media Lario Technologies Incorporated in Italy. The pSCT was made possible by funding through the U.S. National Science Foundation Major Research Instrumentation program and by the contributions of thirty institutions and five critical industrial partners across the United States, Italy, Germany, Japan, and Mexico. Headquartered in Cambridge, MA, the Center for Astrophysics (CfA) | Harvard & Smithsonian is a collaboration between the Smithsonian Astrophysical Observatory and the Harvard College Observatory. CfA scientists, organized into six research divisions, study the origin, evolution and ultimate fate of the universe. The Fred Lawrence Whipple Observatory is the largest field site of the CfA and is host to dozens of telescopes, including the pSCT and VERITAS for gamma-ray astronomy. More than 1,400 scientists and engineers from 31 countries are engaged in the scientific and technical development of CTA. The planning for the construction of the Observatory is managed by the CTAO gGmbH, which is governed by Shareholders and Associate Members from a growing number of countries. CTA will be the foremost global observatory for very high-energy gamma-ray astronomy over the next decade and beyond and will be the first ground-based gamma-ray astronomy observatory open to the world-wide astronomical and particle physics communities. The scientific potential of CTA is extremely broad: from understanding the role of relativistic cosmic particles to the search for dark matter. With its ability to cover an enormous range in photon energy from 20 GeV to 300 TeV, CTA will improve on all aspects of performance with respect to current instruments.